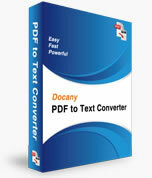 Docany PDF to Text Converter - Batch Convert PDF to Text. Docany PDF to Text Converter is an efficient and convenient program to convert PDF to Text in batch mode. With a few mouse clicks hundreds of PDF files will be converted to plain text files at one time. So you can easily edit, re-use, re-organize, present, and share your PDF files. 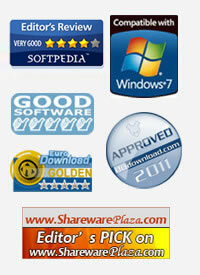 Additionally, it doesn't require Adobe Acrobat or any other PDF plugins to be installed. Convert hundreds of PDF files at a time with just a few mouse clicks. Support drag and drop files and batch conversion. Convert PDF to plain text, so you can edit and reuse your PDF content. Extract the text from a PDF file, and retain its original structure and layout. Normalizes the text in a PDF document to Unicode. Capable to convert password protected PDF files to text, it will ask for a password during importing PDF files. Allows partial document conversion, specify the pages or page range for conversion and this program will convert the document accordingly. Do not need Adobe software or any other PDF plugins to be installed, it does not require Adobe Acrobat, or Acrobat Reader for installation. Launch the program. 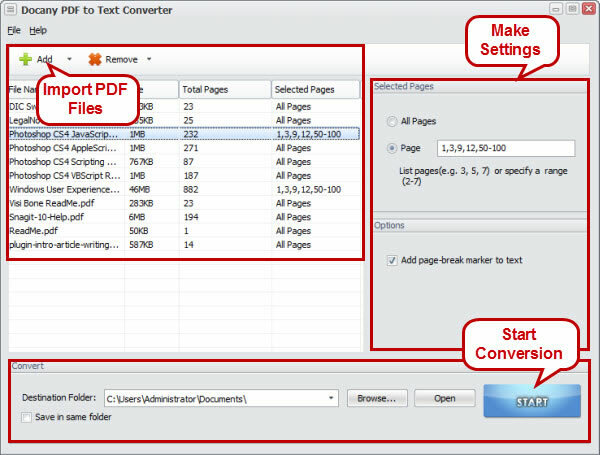 Add PDF files for conversion. Specify conversion options and destination folder for saving text files and press "Start" button. This is all you need to know to successfully use the program and get professional results.